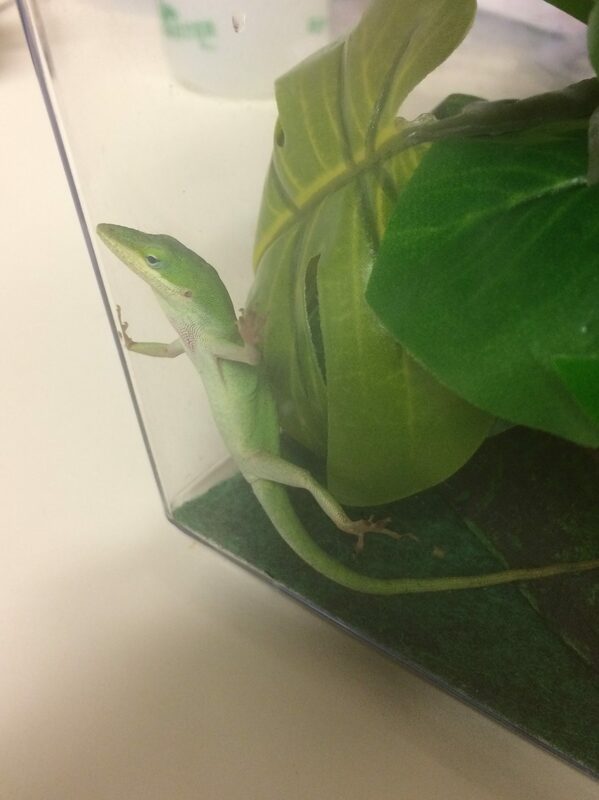 Nearly one whole year ago, our son came home with a permission slip to bring home an anole – a cute little green lizard. We reluctantly signed and Guacamole the Anole was adopted into our home. We bought a cage, greenery and special bark for an amphibian habitat. Each week we went back to the pet store for live crickets, which reside in their own separate cage. To be honest, we did not expect the lizard to make it through the cold Nebraska winter. Slowly, we learned that the 7 lizards in the homes of other 3rd graders died. Then, our Guacamole was the only lizard left. We joked about what a burden it was. We griped about the money we had spent to care for it. But to be honest, I actually started to like the darn thing. The lizard became part of our family. He (she?) even got his own blog post late last year: Out with the Old. Oh, such conflicting emotions! I really didn’t want a lizard in the house anymore – we have enough things to take care of. Yet I felt an odd sadness at the idea of getting rid of it. Or was it guilt? Guilt that giving it away was a failure in this whole “owning a lizard” thing?! This was supposed to be my son’s lizard anyway – does he even care anymore, or is this all about me?? At the same time this was happening, I was faced with a very different decision. I had been asked to preach weeks ago, on a weekend that fit in well with my family’s schedule. Dates were changed and I was asked to preach on a weekend that did not work well in my schedule. I debated internally – do I let people down, or do I make the decision that feels right for me? There was guilt. I am letting someone down, making it more difficult for people to plan. I could just say yes and do what is expected of me – but if I do I’d be failing at other commitments I’ve made. Is this discernment, or am I making excuses to clear my schedule? Should I keep the lizard or give him back?!? Oh, gut wrenching guilt! How often I have failed! Guilt is debilitating. But did Jesus tell this parable to make us all feel tied down with guilt? I don’t think God’s intent is to make us endure guilt. Instead, God inspires us to action. Guilt is a very real human emotion, and a useful part of discernment. But guilt itself can not drive the decisions we make. I know I am not able to preach the weekend I was asked. I will let someone down and there will be guilt, but I sense that to be the right decision in this circumstance. Life is filled with decisions and we handle them the best we can, always in prayer, always discerning a larger purpose. Ultimately, we decided to hand over the anole to another family. It is time to say good-bye to the lizard! Categories: Forgiveness | Tags: decisions, discernment, faith, guilt, lizard, trust | Permalink.